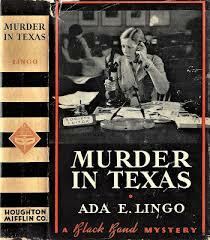 These are but two of the reviews for Ada Emma Lingo's mystery Murder in Texas, the only novel she ever published. Born in Fort Worth, Texas in 1908, Ada and her family moved to Louisiana so her father could take a job with Oakdale Ice and Light Company. Her mother passed away in 1919, and as a salesman her father was constantly on the road, so Ada was shuffled around between several relatives in Texas until she graduated high school. 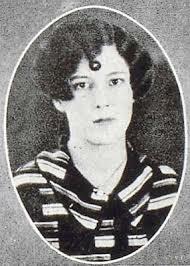 Nicknamed Rusty because of her red hair, Ada was an excellent athlete as well as an outstanding scholar. She received degrees in Journalism from the Collect of Industrial Arts and the University of Missouri before obtaining a job with New York World, Joseph Pulitzer's newspaper. The paper ceased publication in 1931, but by then Ada had married Charles Trabue Hatcher, an engineer and older by eleven years. Unfortunately the union proved to be an unhappy one, and shortly after the birth of their daughter, the couple separated and ultimately divorced. Ada moved back to Big Spring, Texas where she went to work for the Daily Herald as the Society Editor, writing Murder in Texas in her off-hours. However, she couldn't have had much free time, because she was also pursuing a medical degree. She went through the pre-med program at Baylor University, and then received her doctoral fromTexas University Med School. Apparently medicine rather held her attention more so than writing, because Ada only wrote one other manuscript that was never published before relocating to Los Angeles where she started her practice and became a renowned cancer specialist. In her later years, she moved to Olympia, Washington where she passed away in 1988 at the age of 79. In an effort to keep the memory alive of the writers from the Golden Age of Detective Fiction, Coachwhip Publications has issue a new edition.